Our smartphones are capable of all sorts of tasks, but unfortunately most of them drain our phone's batteries pretty fast. There's not much more annoying than running out of battery life far from your charger, which is why the PowerStick+ USB charger is such a welcome device. Plug it into your computer via USB and it will charge its internal battery. You can then unplug it and carry it around with you, since it holds its charge. It comes with a standard USB port for connecting and charging your devices from it, as well as Micro USB, Mini USB and an Apple 32-pin connector for iPhones and iPads. It also doubles as a USB memory stick, coming in storage capacities from 4GB (the version we tested) to 16GB. It's a lot bulkier than previous generations of PowerSticks, but it's still perfectly portable. It didn't take too long to charge up, but you'll still need to set aside a while as it charges. Once done, you can sling it in your bag and forget about it until you need a charge, which can be easily initiated by plugging in your device and pressing the on switch of the PowerStick +. 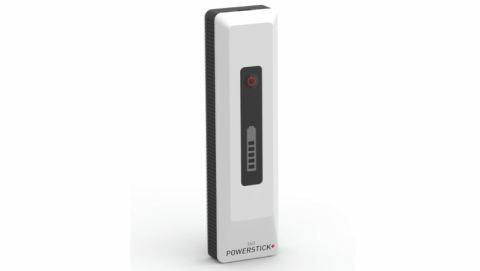 The PowerStick+ stored enough energy for one complete charge of the iPhone 4S. That should be more than enough to keep you going when you're running low on batteries, making this a useful back-up for when you're far from a socket.